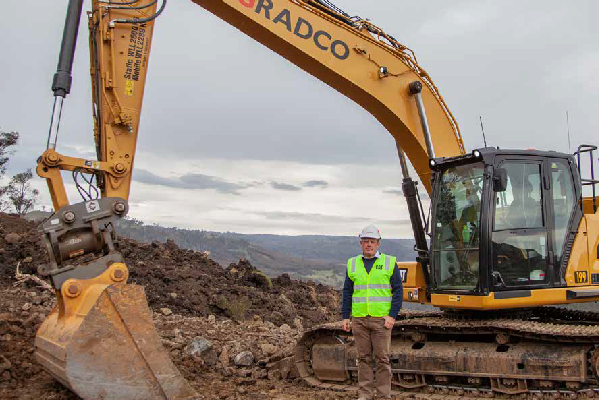 Oliver Diprose, together with his two brothers, Tom and Will, own and operate Gradco, a third generation civil construction business based in Tasmania. Oliver shares his experience with his latest Cat® 323 Next Generation Excavator purchase. “We have been operating for 62 years all over Tasmania in many sectors from road building, quarrying and all sorts of civil construction. We recently purchased the new Cat 323 and are using the machine on our civil sites. We are doing a lot of final trim work with it, batters, drains and a lot of detailed excavation and finishing work around our various sites,” says Mr Diprose. “The thing that surprised us most about the Cat 323 was the operator station. The comfort levels within the cab, how quiet it was and how good it was to operate for our guys. They love operating the Cat excavators and the 323 in particular has taken this to a whole new level. Mr Diprose says, “We are using the technology in this 323 machine to its max. We are using ‘Payload’ a lot when loading tippers on road works jobs and we are using ‘Grade Assist’ when trimming batters to fine tolerances. The technology in this Cat 323 is making the machine very, very productive. “We have a great relationship with our dealer, William Adams. 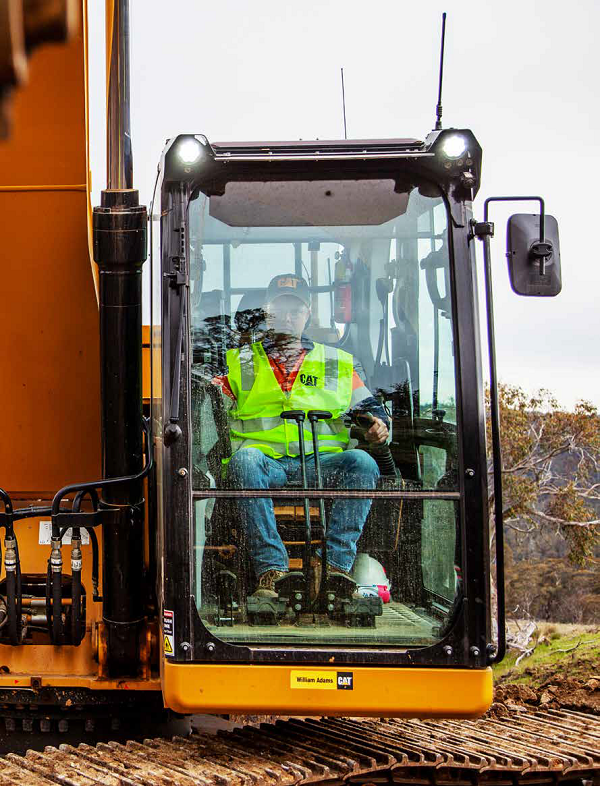 They support us and our machines very, very well, and the Cat 323 is no exception. They have gone the extra mile sending people out, helping us train our people with the new technology – it’s been really good,” he adds with a smile. The Cat 323 offers the industry’s highest level of factory fitted technology as standard. Onboard Cat Connect Technology gives you the edge. Operators of all experience levels will dig, load and grade with more confidence, speed and accuracy. The result? Better productivity and lower costs. Grade with 2D helps operators reach grade faster. Operators cut and fill to exact specifications without overcutting. No grade checkers are needed so the work area is safer. Automated boom, stick and bucket movements deliver more accurate cuts with less effort. The operator simply sets the depth and slope into the monitor and activates single-lever digging. Stay grounded when you dig, lift, swing and load. Prevents the machine from lifting, ensuring the machine is stable. Makes levelling much easier and consistent Maintains the angle of the bucket to the ground when the stick and/or boom are moved. Simplify your work cycle, use less effort and reduce fuel consumption. This feature automatically stops the swinging motion of the machine at a pre-set point. Cat Payload technology delivers precise load targets with on-the-go weighing, which helps prevent over/under-loading and maximises efficiency. Automated tracking helps manage production and lower cost. Cat Grade with Advanced 2D and Cat Grade with 3D increase productivity and expand grading capabilities. 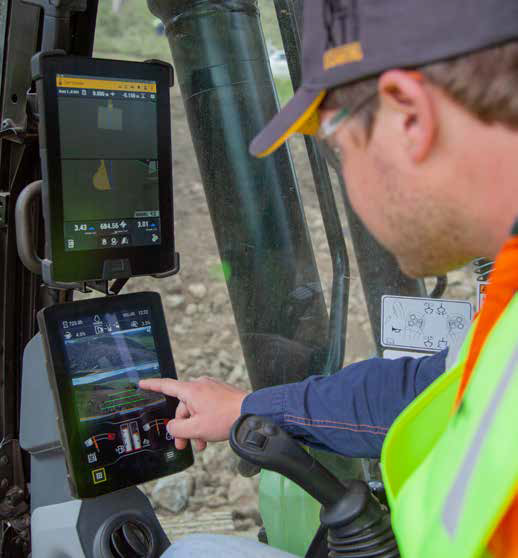 Grade with Advanced 2D adds in-field design capabilities through an additional 10-inch (254mm) high-resolution touchscreen monitor. Grade with 3D adds GPS and GLONASS positioning for pinpoint accuracy.